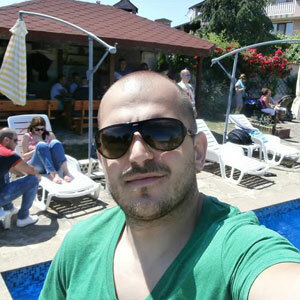 BaseiniVarna.BG is a trademark of Rigel Invest Ltd. a company with long experience in the construction of swimming pools. The company operates in Varna and the region as well as in the whole country. The many successful projects and satisfied customers testify to the high quality and professionalism of our services. 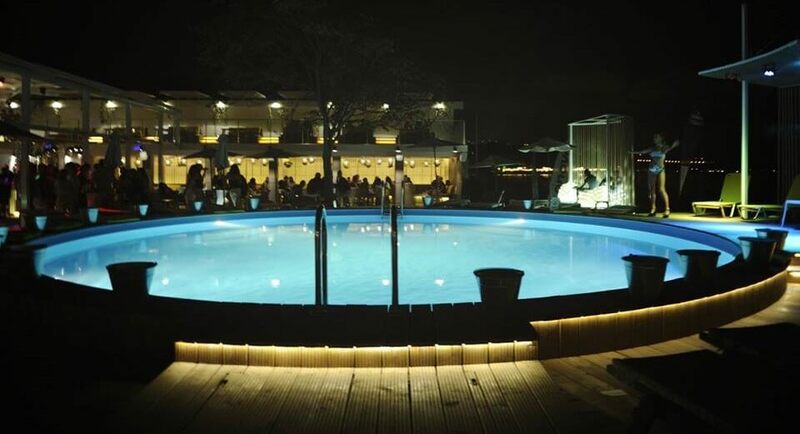 The new FIBERGLASS swimming pools are made of a sandwich structure in several layers: fiberglass reinforced with polyester and vinyl resins, polypropylene honeycom structure for heat insulation or ceramic reinforcement structure and again fiberglass reinforced with polyester resins. Available in four different shapes – Golf, Delta, Marina and Laguna. They are available in several basic and optional colors. 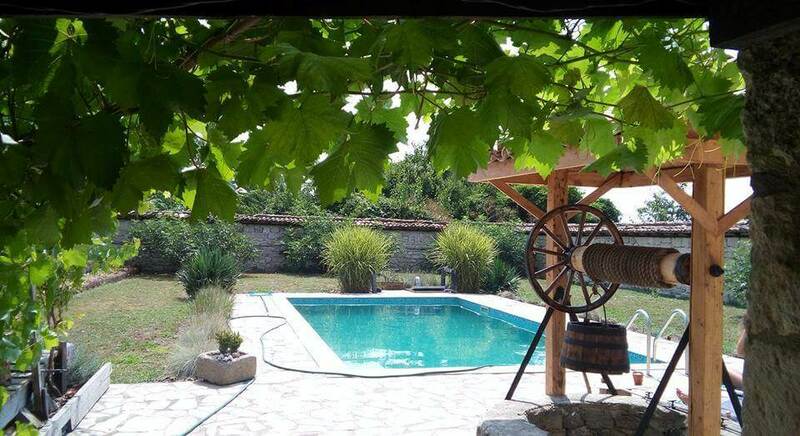 The concrete is obligatory during installation, only gravel and sand is required, and an optional concrete ring on the edge of the swimming pool, as a preparation for the on-board stone. 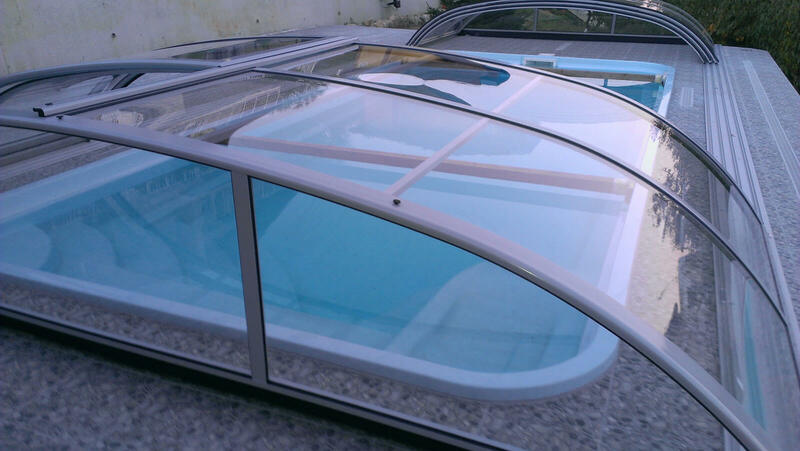 Swimming pool of one body without UV-resistant joints, installation from 3 to 7 days. Glass ceramic tiles are not required. Warranty – standard 3 years. 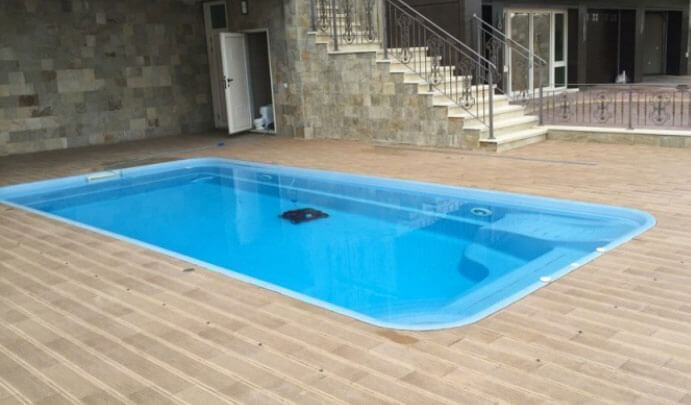 Rectangular fiberglass swimming pool with skimmer – 7,5×3,4×1,5m – District Varna – Delivery and installation, construction works and equipment – all included. Term of execution – 7 days. Warranty – 3 years Price – 24000 BGN incl. VAT. The construction of steel-concrete swimming pools is carried out by the technology for casting of concrete in formwork and by the method of spraying concrete in a continuous cycle. In the casting method, the concrete is poured into the pre-formed form of the swimming pool and then compacted. In the spraying method the concrete is applied to a metal reinforcement. The construction of a steel-concrete swimming pool includes the following basic steps: land survey, groundwater survey, soil composition study, project preparation if necessary, supply of materials and machines to work on the swimming pool, excavation work on the bed laying of formwork or nets, pouring of concrete, overflow construction or positioning of skimmers and service room, plastering, hydro-insulation, laying of nozzles, siphons, skimmers, lining of the swimming pool with glass ceramics or other, tensioning power equipment cables, pipe system, supply and installation of equipment for filtration and water circulation, filling the swimming pool with water, chemical treatment of water. The deadlines for building a concrete swimming pool depend on many factors such as soil condition, swimming pool dimensions and many others. Concrete used for swimming pool construction is different from concrete used for construction of buildings. 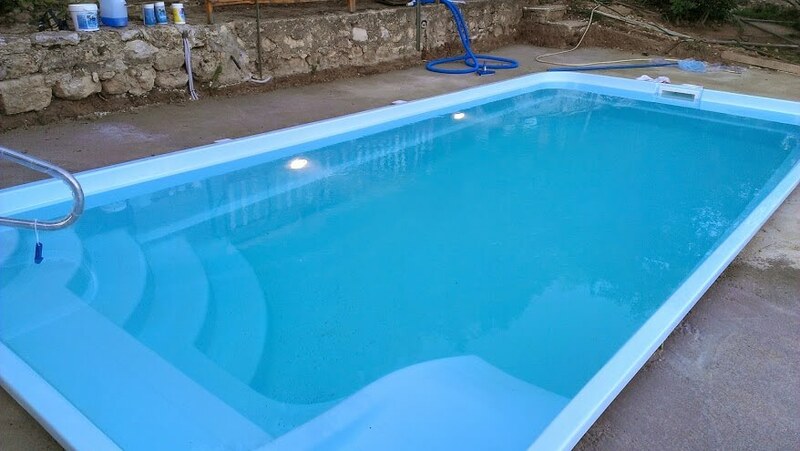 Indicative offer: Rectangular monolithic swimming pool with skimmers – 8x4x1,5m – District Varna – Construction and Equipment – all included. Term of execution – 30 days. Warranty – 3 years Price – 28000 BGN VAT included. How much will it cost me to have a swimming pool? The cost of supply and installation of swimming pool and equipment is determined individually for each customer after preparation and approval of a specific offer. You can get sample offers here, and in many cases they could also be final. It is necessary to be discussed all the details of the installation together with the customer. 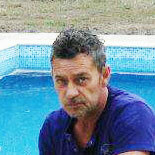 Construction works in concrete swimming pools take about a month – 30 days. 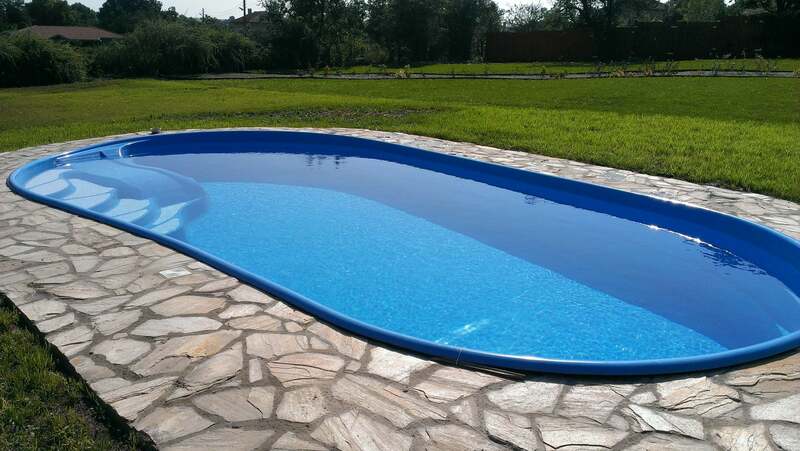 Deliveries of finished swimming pools are usually done within 2 to 3 weeks, i.e. up to 20 days after order and signed contract. It is possible to delay up to a week in a peak season. During the waiting time of the swimming pool delivery, the initial works can be carried out and even a filter group is delivered and installed in the service room. What guarantee do you provide for your swimming pools? The warranty of fiberglass swimming pools is normally 3 years. They are produced in a specialized and certified european plant. The warranty of concrete swimming pools is normally 3 years. They are actually produced locally on the site. The equipment has a 2-year warranty for both concrete and fiberglass swimming pools, but as a generic product is ultimately offered, we offer our customers a 3-year warranty. Which regions the company covers with its activities? It covers mainly but not only the Varna region. Installations can be carried out throughout the country as well as outside the country. Life and length of use of the swimming pools? Concrete – no limit values are set, maintenance and replacement of equipment are possible during prolonged operation. Fiberglass – no limit values, repairs and replacement of equipment are possible. 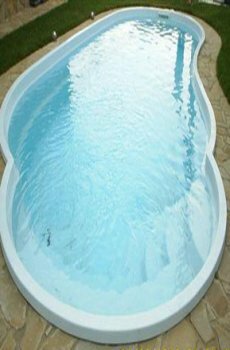 What swimming pool to choose, what are the advantages and disadvantages of concrete and fiberglass swimming pools? The choice of concrete and ready made fiberglass is not easy. Both options have advantages and disadvantages that we need to be aware of. 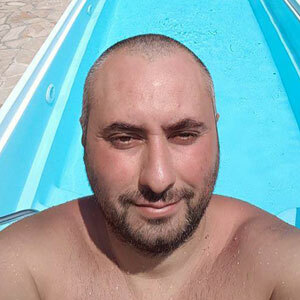 Concrete swimming pools are massive and built-in, extremely heavy structures, which together with the water in the swimming pool, in most cases, are nearly 100 tons, whose settling is unpredictable. A crack in a 1 cm in time, almost irreparable consequences can be caused to the watertight walls and bottom of the swimming pool. The concrete swimming pools are lined entirely with glass ceramic tiles, which are joined together. Chemicals take part of the joint over time and the tiles inevitably begin to fall at a certain point, requiring repairs, and after a certain point these activities are already regular. The construction activities in them take about a month – 30 days. Ultimately, these swimming pools are about 20% more expensive than all other swimming pools. 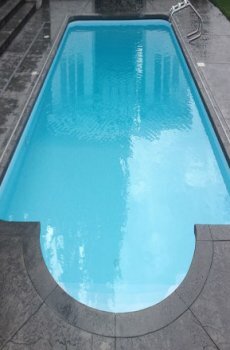 Concrete swimming pools, however, have no limitations in shapes, dimensions and depths. The repairs are relatively simple and rough construction works and can be carried out by builders with experience in such work. Reinforced fiberglass swimming pool bases with several layers of polyester resins and special fabric are delivered ready to site with a special transport and cranes are unloaded in the trench. Installation activities are about 2-3 days. The construction works also last so long. About 20% more profitable than concrete, save time and all rough construction work. There are no tiles and joints, which facilitates maintenance and cleaning. However, they have limitations in shapes, sizes and depths. They still have to be transported to their place and unloaded with a crane for which there must be a physical possibility. But they are still very suitable for family houses and small hotels. The repair, if required, is specific and should only be carried out by a narrowly specialized worker. Fiberglass is the same material as the modern yachts. What size swimming pool is right for me? Appropriate size is determined by the individual needs, possibilities and assets of your own terrain. The most preferred proportions are 6m x 3m, 8m x 4m, 10m x 5m. Alternatives to these sizes are available and can be selected, built and installed. 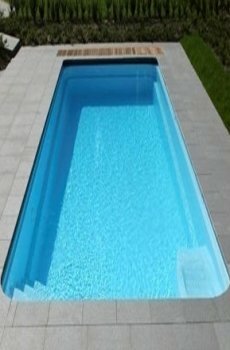 In the case of a fiberglass swimming pool, access must be made to the pool’s hole on trucks with a length of 12m to 15m. Ready-to-use plastic filter room with lid with water drainage and locking mechanism, built-in ground with metal frame and drain holes, feet and pump stand. Filtration pump, based on the size of the swimming pool and its cubic capacity. Sand filter, based on the size of the swimming pool and its cubic capacity. Connections to water and sewage systems network. Electrical control panel with protection, watertight, with breakers, motor protection, defective-current protection and pump timer, for determining its operating mode. Are other colors and thermal insulation available to the swimming pool? There is a wide variety of color combinations in glass ceramics for concrete swimming pool lining. The same is true of fiberglass swimming pools. 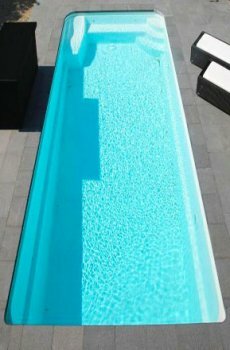 There are blue base colors that are included in the value of the swimming pool’s body as well as additional special colors and 3D colors. They have an option to be ordered with a heat insulating layer – a lattice structure from PPR that strengthens the reinforced body and makes it even more flexible and durable. It also helps to keep the higher the water temperature for longer. 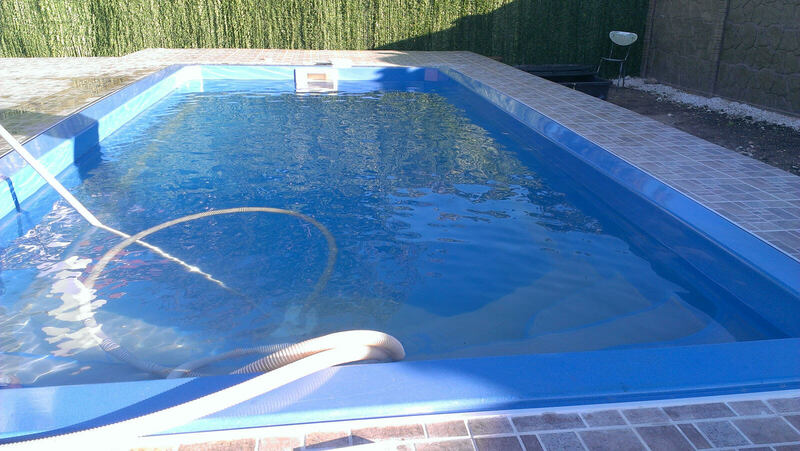 What should be provided by the customer on site when installing a fiberglass swimming pool? The client must provide physical access to the site / parcel for mechanization – excavator, transport truck and truck or position as close as possible to the swimming pool trench. The site must be available to the installation team – electricity and water, ie suitable wiring and plumbing power supply to the location of the service / filter room. 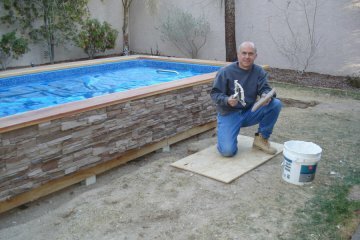 What construction work should be done for a fiberglass swimming pool? Reverse backfilling after installation of the pool and equipment while filling the swimming pool with water. The backfilling may be desirable to be filled with sand and gravel delivered to the site, as these materials do not have to settle for 2 years, such as excavated soil. Optionally, a cast / concrete ring / walkway / beach around the swimming pool can be cast as well as a boarding stone around the swimming pool. The paths can be covered with granite or decay. The Construction and Assembly Works can also be executed by the client, if possible and willing, on the part of the client, following the instruction and familiarization with the specifics of the work. Do you need concrete for the swimming pool? In all swimming pool variants, foundation concrete is recommended. 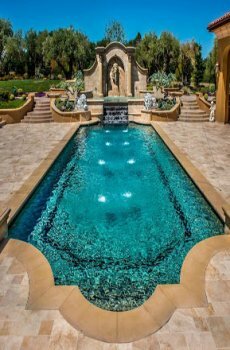 Fiberglass swimming pools require a leveling base, which is most often achieved by casting foundation concrete, which also protects the body from damage to the bottom of the dredged stones, as well as underlying in the time. On the bottom floor is laid a concrete floor, dense fiber or other thermal insulation on which to lay without risk the swimming pool body. The foundation concrete is not obligatory, and sand can be laid as a sand pillow, where the leveling is difficult, and in this case the heat insulation on the concrete is layed. What chemicals do you need in the spring to open the swimming pool and to prepare the swimming pool for the winter? Each equipment contains a chemical tester kit to dosing and monitor the levels of chemicals needed for the normal operation of the swimming pool. These are: -PH- regulator, fast / shock chlorine, slow-soluble chlorine, algicide. Installations such as salt electrolysis, UV lamps, etc. may be possible where the need for chemicals can be reduced but not completely replaced. When starting and ending a season, in many cases, it is necessary to have a shock treatment of the water with the above-mentioned chemicals. 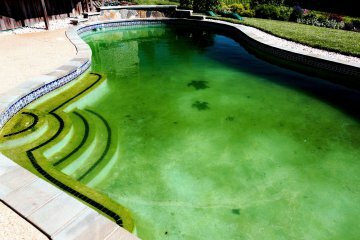 How to maintain / clean the swimming pool regularly? The cage serves for seeding the surface leaves, mosses and other wastes on the water mirror. The vacuum cleaner with telescopic finger serves to collect waste from the bottom. For proper use, first vent the hose / ribbed hose thoroughly by filling it with water and then hooked to the opening of the skimmer or the suction nozzle to create a vacuum through which the sucked debris that is retained in the pump head , and the water passes and purifies through the quartz sand filter. The filter should be cleaned regularly when the pressure gauge is changed / overtaken / entered into the red section. The brush from the kit is used to clean the hard-to-reach areas and the swimming pool walls. 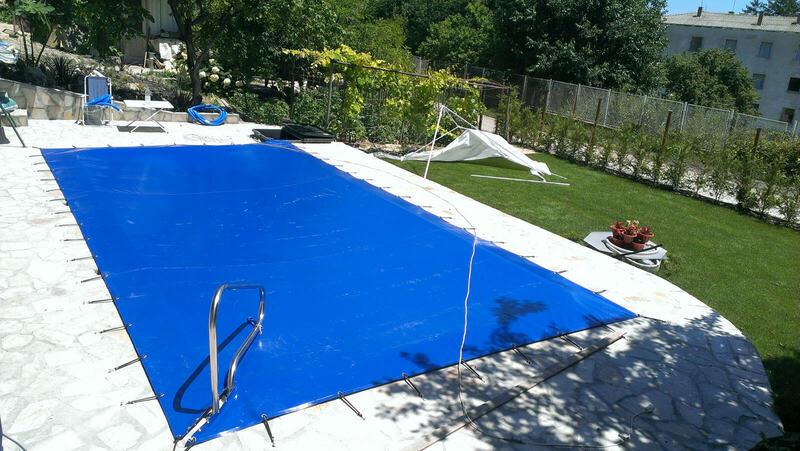 What swimming pool covers are needed in the summer and in winter? The summer solar temperature-retaining PE covers reduce water surface contamination. Winter antisolar PVC covers are virtually indispensable as they keep the water clean and protect against the growth of microorganisms and eliminate the need to replace the water in the swimming pool, thus saving water and chemicals, as well as time. For both types of covers, there are suitable metal or wood structures to facilitate the use or increase the effectiveness of the covers. Telescopic, all-year polycarbonate coatings with aluminum construction protect the water against contamination and protect children from water. In addition, they can also be used as a winter garden, extend the pool season and give the swimming pool a complete look. Download the instruction for exploitation of swimming pools. 24000,00 лв. – 34000,00 лв.